Pippa and her gymnastics team achieve their dream -- to go to Nationals. They compete against the best in Paris, then Region (half of Ile de France), then the Zone (all of Ile de France) in order to qualify. Because theirs is an after-school gym 11-hours-per-week program, competing against mostly kids who do special sports-study programs with 20 hours per week of gym, it's very unusual for girls from this Paris gym to make it. In fact, it's been about 10 years since a team of young girls made it all the way. But what makes it even more incredible is that not one but two little girls teams (ages 10-13) make it -- Pippa's (the A team) and the B team. This beam routine below is Pippa's big contribution to her team, boosting them from 8th place to 6th place, even though overall, she's not actually one of the team's anchors. 6th place sounds amazing. 6th place! At nationals! But wait: In fact, I have to qualify this. They don't qualify for the A finals (top 48 teams around the country). They qualify in 53rd place, which means they compete in the B1 finals. And there, they come in 6th place. If you compare the scores of all the finals brackets -- A1, A2, A3, A4, B1, and B2, they came in 50th, out of a total field of 72. 50th may not sound so great. But for further qualification, these girls have the meet of their lives. Every one of them really shines and pulls off amazing stunts. With any of them absent, they couldn't have scored higher than 8th place, and might have gone as low as 10th, out of 11 in the B1 category. And, as we see it, 50th in the nation at the highest possible level of competition for their age is still something to brag about! The girls themselves are so happy with their performance they occasionally glisten with tears of joy. The parents are screaming, shouting, jumping for joy, high-fiving each other in the stands (it should be said, we are a very international group, with several American parents), welling up with tears, and, in my case, sobbing hysterically throughout, unable to breathe or speak properly. I did not predict that would be my reaction, but it turns out, I'm a sobber. 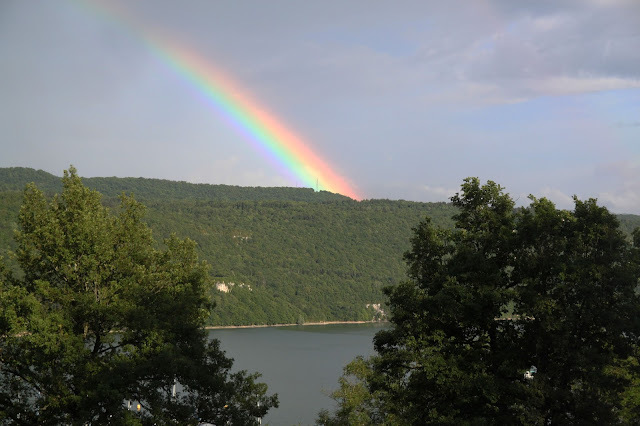 We see this rainbow from our hotel (actually a gite, for those in the know, which is more like a cabin than a hotel room) the night before the competition. Good omen? The B team comes in 72nd, out of 72, losing by a hefty margin. But even then, the fact that they qualified for Nationals at all was such a surprise and a treat, that we are all super proud of them. And they also pull off lots of new and impressive tricks -- some of them even higher scoring than the girls on the A team managed! -- so we have to qualify that what seems like a devastating loss is actually an enormous point of pride for us all. What do a bunch of gymnasts do to de-stress the day before competition, held in a crappy little gym in Oyonnax in the Jura, the mountains of eastern France, about a five-hour drive from Paris? They enjoy being outdoors, and not in the city. Yes, I know it looks like the flying girl is about to kill the swimming girl, but it all works out just fine. Remember, we're in France, so we (and the hotel pool) are pretty lax about safety. Having said that, even the French parents start getting nervous that somebody is going to crack their head open as the jumps, dives, and gymnastics flips start getting more daring and are relieved when the girls get cold and get out. In case you're wondering what the French breakfast of champions looks like before the biggest meet of their lives, it's hot chocolate, orange juice, and some buttered bread. You may also have yogurt. But you will not have eggs or anything else hardy or with protein. Sorry, people, this is still France, after all. It's not all that substantial, but it still seems healthier than the French lunch of champions, which is greasy fries and burgers. Amazingly, at all of the gym meets where they serve food, greasy and sugary things are pretty much the menu du jour: lots of fries, Nutella crepes, and French hot dogs. Speaking of champions, this girl in red below, who I subtly try to photograph by pretending to aim at my friends cheering and clapping in the background, is Clara Beugnon, a French elite gymnast who competes at the country's top level and just missed qualifying to represent France at the Olympics in Rio. The French team itself just barely qualified -- as I've said before, smaller country, mellower gymnastics program, and they've only ever won one gymnastics medal (Emily LePennec in Athens). I wrote a lot of our trip to Vannes and Bretagne, but why do we go there in the first place? Well, why does anyone go anywhere? For a gymnastics competition (of course). Not just any competition, but individual Nationals for Pippa. Wait, I need to qualify that. These are the Nationals among Catholic private schools, that have gymnastics programs, so it's certainly a reduced applicant pool. Having said that, many of the top contenders are "real" nationals competitors, also. Like Pippa, many of the girls train at a "real" gym, then compete on their school team. Basically, Pippa's there as a ringer, but she's not the only one. I'm grateful for this because one of the other coaches (of a whole team of ringers) sees that Pippa is doing some genuinely difficult tricks and that her coach is not a true gymnastics coach (an excellent school gym teacher, but not a trained coach). So, for Pippa's safety, he comes over, spots her in warm up, checks on the settings for the bars and vault, and such. It's such a lovely show of good sportsmanship. You can see him watching her warm up on the beam, with his back to us. Largely on the strength of this floor routine (which came in 4th place for floor with an 8.2 score), Pippa places 7th overall. But wait, I have to qualify that, too: this competition is in wide grade brackets (hers is 6th and 7th grade), instead of age, and since Pippa is a year ahead in school, she is a 10 year old competing against 11, 12, and 13 year old girls. There are just two other 10 year olds to make it to finals, and Pippa beats them by a long shot. So, among 10 year olds, she is 1st; in her competition bracket, 7th. And either way, she is super excited and proud to be here, as are we, cheering for her in the stands. 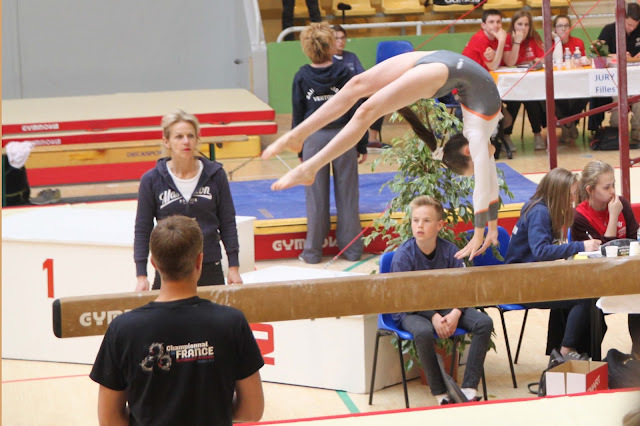 This posting doesn't tell you much about life in France, unless you happen to be interested in the intricacies of French gymnastics competitions. But it's a chance for me to share (boast, show off, call it what you will...) the accomplishments of my daughter and her teammates, in their winning of 7th, 4th, 1st, 6th, 50th, 13th, and 72nd places, or however you want to look at it. They don't make it to the podium, but they do their best. Let's just leave it at that. And no, in case you're wondering, they don't get medals or trophies. This is not a country that gives medals just for participating, even at the Nationals level. But they walk away with some grease in their bellies, some souvenir T-shirts that we buy them, a small injury or two, and very proud memories. Galet de Bain is a raw cows' milk cheese made in Bretagne -- the town of Bain-de-Bretagne specifically, hence the name, in the department of Ille-et-Vilaine. A galet is a pebble or stone, and there's a small play on the word "bain" in the cheese's name, since it refers both to the place name and also bathing/swimming, as in the nearby coves where there are lots of pebbles. The cheese looks something like a stone, too, gray and rough and rugged. However, I have a feeling that if you tried to ricochet -- that is play skipping stones -- with this cheese, it would just sink like a lead weight. Galet de Bain is made at La Caprarius farm, which seems like a funny name for a farm making cows' cheese, but they've also been making goat cheeses, as you would expect, and sheep cheeses, in this location since 1989. 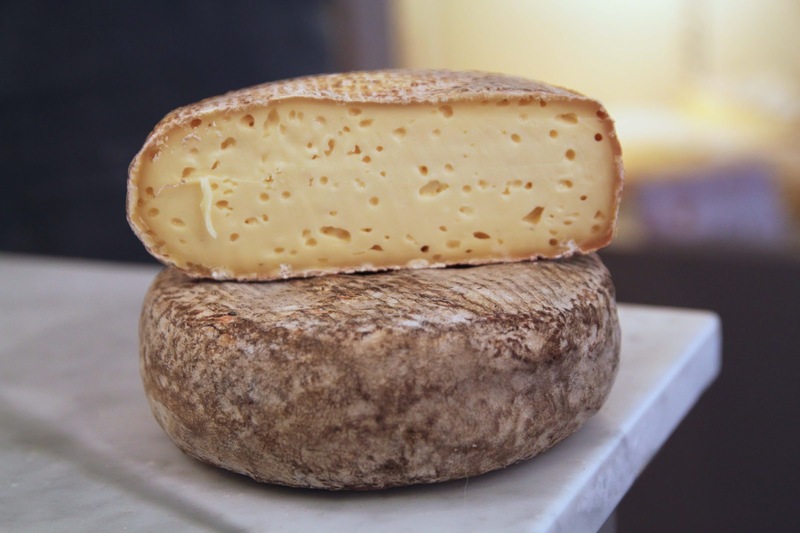 Galet de Bain is an artisanal and organic cheese, created at this farm and made only here. After being aged 3-4 weeks, the cheese is semi-soft but, as the following photo will attest, still fairly firm when refrigerated. It's a stinky foot-fungus sort of cheese, with sweet notes that emerge from the funk. I can tell you from experience that the leftovers make interesting -- but not necessarily ideal -- grilled cheese sandwiches. The name of this cheese could be a reference to our trip to the championships at Oyonnax where the girls play in the pool (bain) and where we skip pebbles (galets) on the lake. But I have to qualify that by explaining that Galet de Bain actually serves as a better reference to the championship trip to Vannes, since that is where we get the cheese, from the lovely Fromagerie de Kérouzine. Bretagne is also the region where the cheese is made. It may not be a medal-winning, award-winning, podium-level cheese, but it's doing its best and is very high quality, enjoyable, and smells like sweaty gym feet, making it a fine choice to pair with this story. Congratulations, congratulations & again congratulations to you all. Well firstly congrats to Piippi, then to you and your family because your support makes it all happen and then to her team mates.